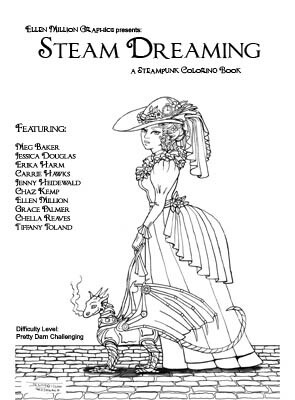 Steam Dreaming is in stock, but selling out quickly! Click the link for more information. Our next Sketch Fest is scheduled for September 17-18! Mark your calendars! I have a slight coding problem and accidentally re-designed EMG-Zine last night. I'm sure this problem can be treated with medication, but in the meantime, enjoy the new look and browsing. Let us know what you think by sending us a letter to the editor! I should have the proof in hand this week, and stock will be about 6 weeks off from that. This is a gorgeous book, and may even be nicer and more useful than the previous two! Torn World has several new features to offer, including tours, which are a great way to browse stories and artwork in our archives. This week begins a new plot arc, and new stories and artwork are being posted regularly! Be sure to check out the glasswork that Torn World has inspired! We are in need of active critics! If you've got opinions, a solid background in art, and would like to give structured critiques to help your fellow artists improve, please contact me!